The total process is about 6 months. That includes designing the house plans, permitting, financing if needed, and construction of the home. Woodstock Custom Homes will give you a fixed price for your project up front and that will be the final price at closing. Do you charge for change orders? No. There is no charge to make changes to your plan. Are my interior or exterior selections limited? No. You may select any material, brand, and design you choose. You are not limited to a couple of choices. Can the floor plans be altered? Absolutely. At Woodstock Custom Homes we encourage redesigning floor plans so the house is exactly as you would use it. I have my own plans, can they be used? Yes. We can build from your plans. We will review them with you and even offer some suggestions. I already own a lot, will you build on my lot? Yes. We are able to build on your lot or land and in most neighborhoods that allow custom builders. Standard flooring is ceramic tile in bathrooms and laundry room, hardwoods in the living areas, carpet in bedrooms. Solid core interior doors. Granite counter tops. Anderson windows. 90% efficient gas furnace. Crown molding in great room, dining room, and master bedroom. Irrigation system. A complete list will be provided during the design phase. Yes there is. In addition to a pre-close inspection with the construction supervisor, Woodstock Custom Homes will return after 90 days and correct any issues that may occur. 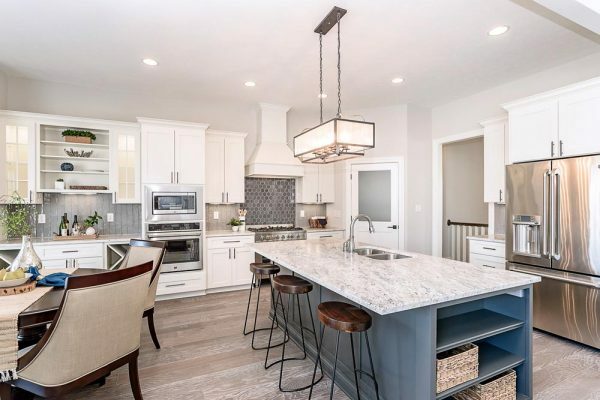 In addition to all of the manufacturer’s warranties, Woodstock Custom Homes will provide a written 2-10 Builder’s Warranty that may be transferred if the house is sold.